Rafaël Rozendaal, a 33-year-old New Yorker with Internet tattooed on his inner lip, has a knack for turning screensavers into art. As the online king of digital art, he builds interactive websites that draw as many as 40 million viewers a year. 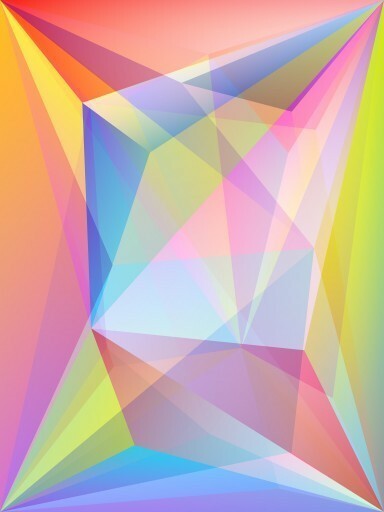 And unlike a gallery with paintings or sculpture, his websites allow you to play with works like ifnoyes.com, changing the way they look by moving your cursor across the screen. Visiting the site is free, but the auction house Phillips is certain that cutting-edge collectors are ready to shell out as much as $6,000 for the right to call the site their own. Digital artists have made it to the block before, but never as they have in Paddles ON!, a collaboration between the social-media platform Tumblr and Phillips, the world’s third largest art-auction house. The sale, scheduled for Oct. 10, showcases 17 digital-art pioneers with works that include websites, YouTube videos, software and an animated GIF, the digital version of a flip book, which was estimated to sell for $1,800. “We’re presenting these artists as part of a new wave of artmaking, from a generation where using technology isn’t radical or experimental but a given and an essential part of their creativity,” says Megan Newcome, Phillips’ director of digital strategy. Collectors are curious about this new genre, she says, although there’s always skepticism about work that can’t be hung on a wall. It’s the latest in a century-long tradition of boundary-bursting art, from Marcel Duchamp’s urinal to James Turrell’s ephemeral lighting schemes. For artists, the appeal of digital work is obvious: it’s an ever changing medium with untethered potential for viewers. And it’s economical. Many of the artists featured in Paddles ON! first gained momentum in 2008, on the heels of the recession. “People are going to look back and see that as a turning point for digital art, because young artists could no longer afford studio space or paint. A laptop is expensive, but over the life of your creative process, it’s the gift that keeps on giving,” says Lindsay Howard, the auction’s curator. The digital generation is creating new models of pricing and patronage. After all, how do you own a website or a GIF? Owners of Rozendaal’s work take over the site’s domain name–one of the few things on the Internet that he believes are both unique and tradable. His art-website sales contract requires the owner to renew the domain each year and keep the art accessible to the public. The contract is shared online for other artists to modify for their work. Assigning value to, say, a YouTube video is another challenge. “Pricing always makes me uncomfortable,” says Petra Cortright, whose webcam video RGB, D-LAY is up for auction. Cortright markets her work with an equation: video’s current view count x amount per view = total current price. 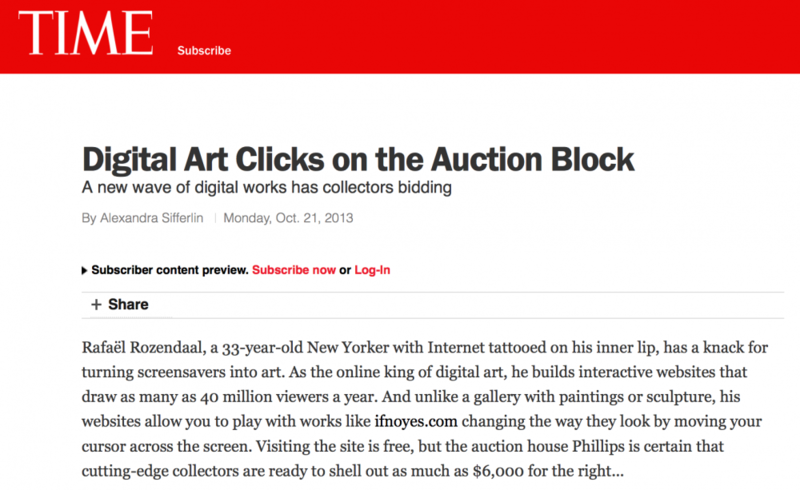 That encourages collectors to keep circulating the artwork online to increase its value.